The undercard of the IBF 140 pound title fight between Zab Judah and Kaizer Mabuza, held at the Prudential Center's AmeriHealth Pavilion in Newark on March 5, will feature an exciting group of local NJ/NY fighters. This will be the inaugural event for the AmeriHealth Pavilion, which traditionally serves as the NJ Devils practice facility. Prudential Center fans have come to anticipate the promise of a truly exciting boxing experience when they come to see Brooklyn's, Sadam Ali, 11-0, 6KO's. The Jr. Olympic national Champion has scored 5 professional wins at Pru Center and has developed a loyal fan base here. In his toughest fight to date, Ali is slated to take on Juliano Ramos of Sao Paolo, Brazil, 16-4, 13 KO's, in an 8 round welterweight clash. Ramos has been in notable fights with Mike Jones, Kermit Cintron and Yudel Johnson. An 8-round Middleweight southpaw battle will ensue when Norwalk Connecticut's, Tarvis "Marvelous" Simms, 26-1-1, 11 KO's comes up against tough, durable, John Mackey of Washington DC, 13-5-2, 6 KO's. In his last appearance at Prudential Center, Simms scored a unanimous 6 round decision over Willis Locket. Dong-Chul Yun, 9-4-1, 7 KO's, is travelling from South Korea to the United States to make his US debut vs. Joselito Collado, 11-0, 3 KO's. 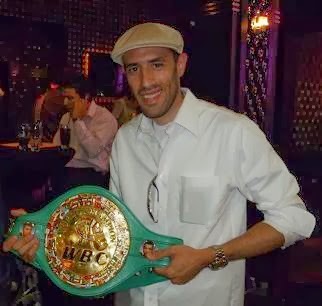 Collado will bring a large contingent of fans from Queens, NY to cheer him on in the scheduled 8 rounder. Five-time Golden Gloves winner, Shemuel Pagan, Brooklyn, NY, made his victorious pro debut at Prudential Center in August 2010. Pagan returns to Newark for a 4 round Lightweight fight against Philly's, Lonnie Jackson, 1-0. Early in their amateur career Jackson beat Pagan by 1 point. Joseph Judah, Brooklyn, NY, 5-1-, 1 KO, is making his first appearance on one of his brother Zab's cards. Joseph will try to better his record when he takes on Greg Hackett of Chester, PA, 2-5. Lightweight, Joe Peralta Alejo, of Jersey City, 4-1. 2KO's, adds more local flavor to the card in his first fight back since he upset undefeated, Christian Martinez. The 4 round opponent will be confirmed shortly. Local Jersey amateur favorite and 2010 NJ Golden Gloves Champion, Vinny O'Brien, will make his pro debut as he takes on David Navarro of Philadelphia, PA, 0-1. O'Brien is trained by former heavyweight Lou Esa who also fought in an ice arena during Main Event's Ice World days. Judah vs. Mabuza will be distributed in North America by Integrated Sports Media for live viewing at 9 PM/ET 6 PM/PT on both cable and satellite pay per view via iN Demand, DIRECTV, Avail-TVN and DISH Network in the United States, as well as Viewer's Choice, Shaw and Bell TV in Canada, for a suggested retail price of only $29.95. The Ali, Simms and Dong Chul Yun fights will be televised along with the Judah vs. Mabuza title fight.